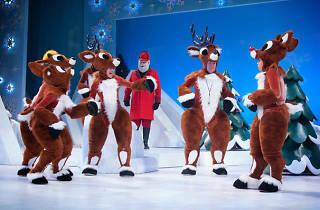 Everybody's favorite reindeer comes to life in this stage adaptation of the TV classic Rudolph The Red-Nosed Reindeer. But he won't be alone, all the characters from the 1964 original will be there for this musical, including Bumble the Abominable Snowman, the Misfit Toys and Clarice. The production, which premiered in Chicago last year, will include songs like "Jingle, Jingle, Jingle" and "Holly Jolly Christmas."